Building No. 100 is the main academic building on the Tokorozawa Campus. It was constructed to be in harmony with its natural surroundings, and features unique thin wall layers overlapping each other for a vibrant setting. A rich variety of changes from the Main Gate extending to the building itself provide a stimulating environment for students to socialize. The Tokorozawa Campus serves as Waseda University’s main campus, and includes the Administrative Office. This is where office duties are handled for the Faculty of Human Sciences and the Faculty of Sport Sciences Undergraduate/Graduate Schools, and related institutions, as well as the Advanced Research Center for Human Sciences. Various procedures are carried out, documents are issued, and procedural and system-related consultation is provided here. 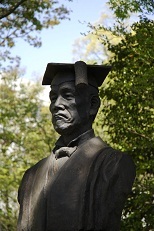 This bust of Shigenobu Okuma is centrally positioned on campus. 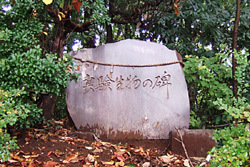 Just next to it is a stone monument engraved with Waseda University’s Mission, said to be the university’s starting point. 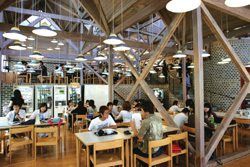 These cafeterias are popular among students as places to dine and chat. There are various items to choose from on the menu, including donburi (a bowl of rice topped with meat, etc. ), noodles, Japanese curry, combo meals, and vegetarian dishes. These meals not only taste great, but are nutritious as well. Hours may be shortened, or the store may be closed during holiday periods in the summer, winter, and spring. Check the store bulletin board for details. A message is written in Latin above the entrance. A message to students from the campus designer. This shop is run by the Waseda University Co-op. Items for sale include books, stationary, foods, beverages, and various sundries. 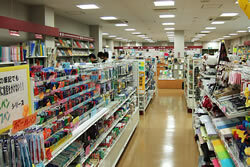 Play guides, test applications, and various services are also offered at the service counter. Various necessities for student life can be purchased on the Tokorozawa Campus at a special Co-op Members’ price, making the co-op a great partner in your studies. 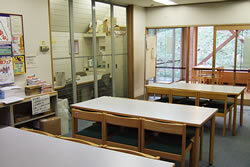 Textbooks and research-related materials and magazines are available. Various test applications and travel plans, etc. are available. The Health Support Center’s Tokorozawa Branch provides health services to maintain and promote good health for university students and faculty members. Doctors and nurses are available at the Health Support Center in the time of their tern to provide examinations, consultation, and various medical-related measures. Computers are available for students to use in the computer lab. All Waseda University students can log in using the provided account, allowing them to browse the web, send/receive email, and perform various tasks. Computer-related classes may be held in this room at a period throughout the day, but it can also be used for individual studies when no classes are being held. 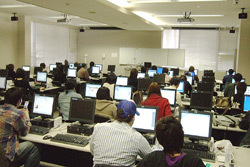 Management and consultation regarding computers in the computer lab are carried out in the Tokorozawa Information System Management Room. Hours and availability may change during holiday periods such as summer and winter break. 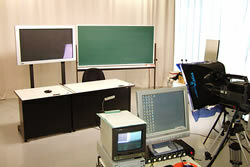 Classes for the School of Human Sciences’ Distance Learning Program (e-School) are recorded in this studio. The studio includes production equipment for recording, editing, and distributing videos that are produced on a daily basis. High-resolution class videos are made available online, enabling a large number of students throughout Japan to participate in courses held by faculty in the School of Human Sciences. 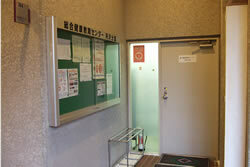 This branch of the Career Center is located on the top floor of the Tokorozawa Cafeteria II (called Ki no Shokudo). In addition to job search materials, career counseling is available for students at irregular times. This bronze statue is the symbol of Tokorozawa Campus. 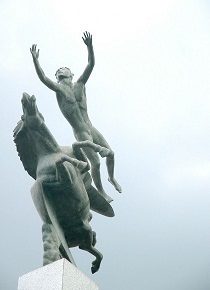 It is located at the campus entrance, and depicts Bellerophon, a hero of Greek mythology, flying with Pegasus on their way to kill the mighty Chimera beast. Ascending toward the heavens with great courage is an expression of hope, that our students will similarly spread their wings and fly into the future, boldly pursuing whatever challenges await them. 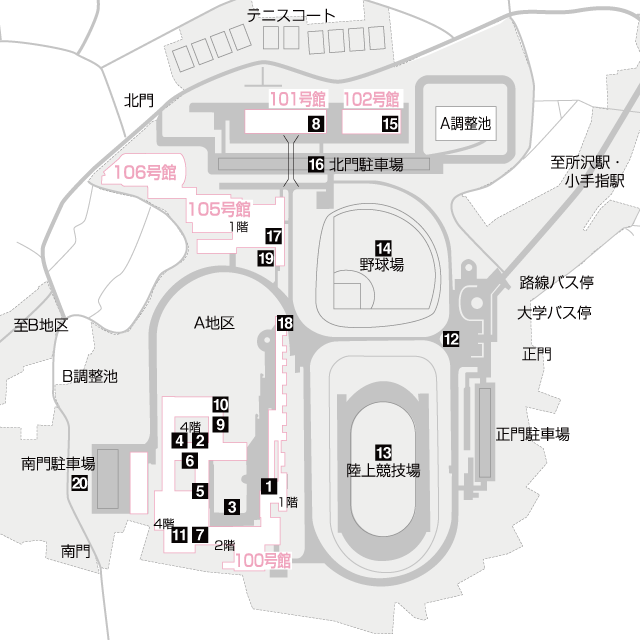 Featuring a nine-lane, all-weather 400-meter track, the arena has acquired third level authorization from the Japan Association of Athletics Federations. 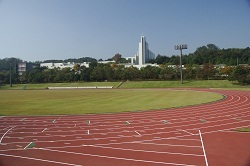 It also serves as a home ground for Waseda’s Track & Field Club. The arena was named after Mr. Mikio Oda to mark his 100th birth anniversary in 2005. Mr. Oda became the first Japanese gold medalist when he won the triple jump at the Amsterdam Olympics in 1928. 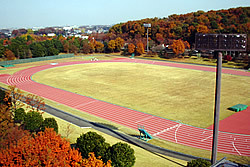 This multipurpose ground includes a full-sized baseball field, about the same size as Meiji Jingu Stadium, and is also used for various sports classes other than baseball. 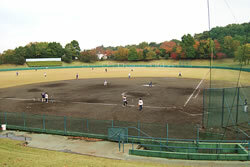 In addition to sports classes, the ground is also used by Waseda’s Softball Club for practice on a daily basis. 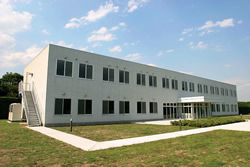 The Tokorozawa Common Use Building for Students was completed in spring 2004, featuring 44 booths for circle groups, and three seminar rooms, which are used for circle groups from the School of Human Sciences and School of Sport Sciences, etc. It is a great place for new students to exchange ideas and get to know each other. A parking area for students is located behind the Multipurpose Ground (Baseball Field) and Sports Hall. Students must obtain a permit to park here. A parking area for bicycles and two-wheeled vehicles is available next to vehicle parking at the Main Gate (application required). 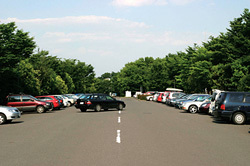 Refer to the Tokorozawa Campus Administrative Office website for parking hours and how to apply. A student parking permit is required. 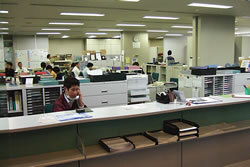 Students can apply at the Tokorozawa Campus Administrative Office. This area is available at the Sports Hall. 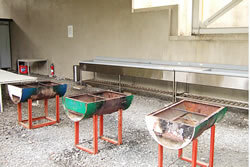 People can barbecue here on a bring-your-own-food basis. 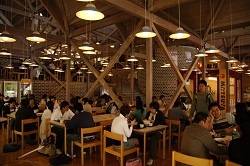 It is used as a place to socialize during seminars, etc. Ask at the Tokorozawa Campus Administrative Office for details. 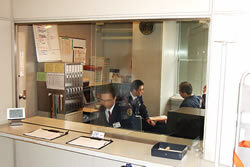 The security room is located at the entrance of Building No. 100. Security guards are stationed here to assist visitors and keep the campus safe. Since Building No. 100 is built on the slope of a hill, following the geography, so it can be easy to get lost for first time visitors due to its structure. Please ask here for directions if you are unsure about how to get to your destination. The Monument to Experimental Animals is located in a thicket to the left as you enter the South Gate. It was erected in November 1989 as a way to commemorate the animals used for lab and field work, with an unveiling ceremony held on the 25th of that month. 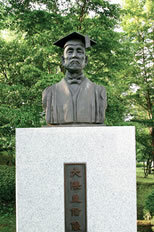 Efforts to erect the monument were led by Kuniji Asai, first dean of the School of Human Sciences. It was crafted using Nebukawa stone, with writing engraved by Keifu Motegi, a resident of Hasuda. A memorial ceremony has been held annually by Naka Yoshitomo, Chief Priest of Nakahikawa Shrine, since the monument was first erected. Experimental animals are used at the Tokorozawa Campus for research and education to promote health, and deepen understanding of the human body. To express our appreciation to the animals that were sacrificed for this goal, and to renew our awareness and respect for life, an experimental animal memorial ceremony is held on the first Saturday of December every year, in front of the Monument to Experimental Animals. This stone monument emulates the soul of human sciences. 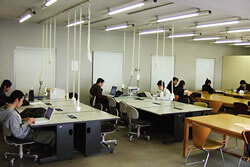 The Tokorozawa Campus features wireless LAN for easy Internet access. High-speed Internet is available in all classrooms and various other places throughout the campus to those with a wireless LAN (IEEE802.11b) capable computer. In an age where computers are essential for everyday communication, report and thesis writing, and job searches, etc., the wireless LAN available at the Tokorozawa Campus is very convenient for studying and student life.